Man can not live by bread alone. 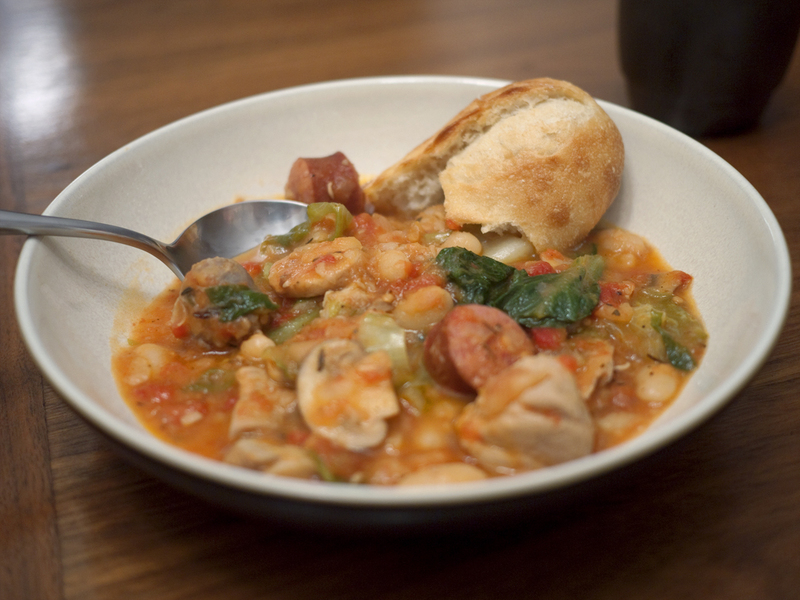 So, you should occasionally have some cassoulet. Ok, so this is not completely conforming to the new low fat, low carb menu planning standards we have set for ourselves at the Voodoo (Home) Economist. The dish is however wholesome, stick to your ribs, fare that when consumed in moderation, sits squarely within the new world order. Hey, I had the sausages leftover in the freezer. What's a guy to do? Laissez Cassoulet! Heat the olive oil in a good sized cast iron dutch oven. Add the Italian sausage and pork loin, brown until a lot of the fat renders out. Add the kielbasa (which is already cooked), mushrooms, onion, garlic, thyme, and bay leaves. 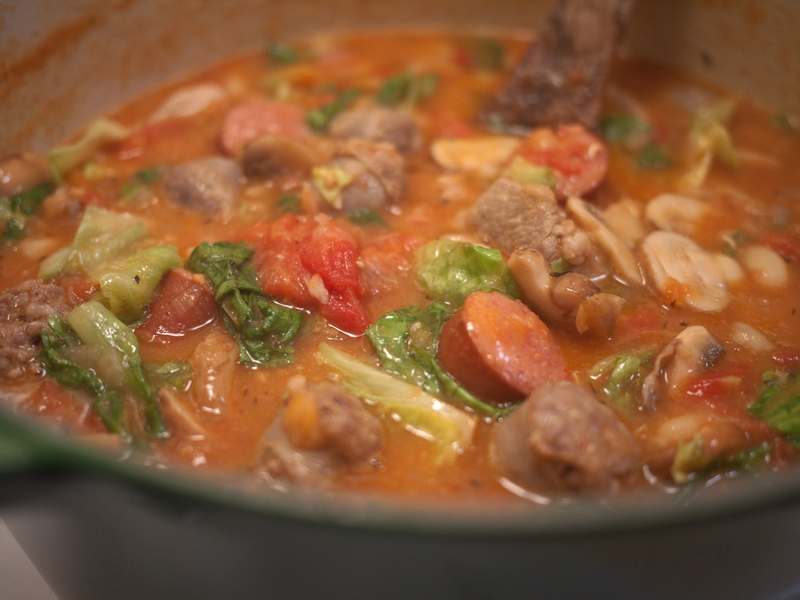 Cook for about five minutes, stirring to incorporate all of the ingredients. 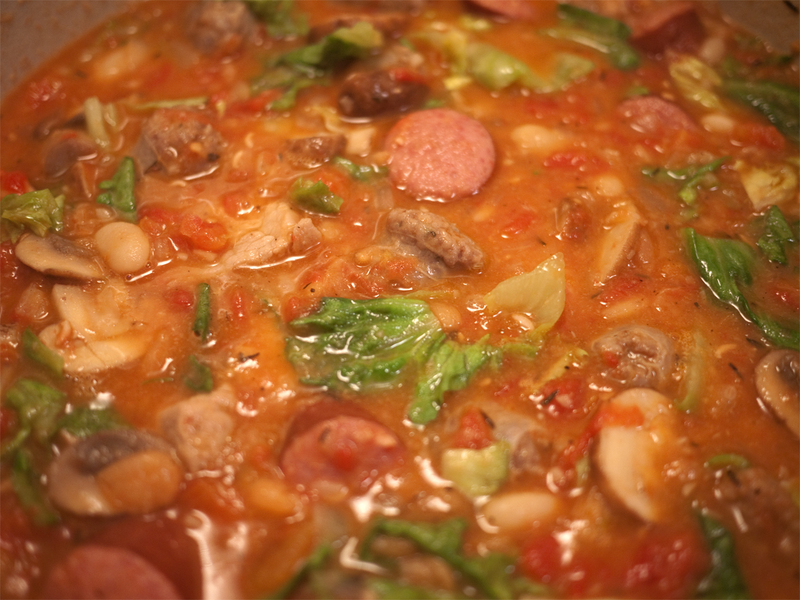 Add the beans, I used 2 cups of Navy beans I had cooked the night before but, canned is fine. Add the tomatoes and their juice, and enough water to cover. If you have bean broth, use that. Liberally grind black pepper to taste. Bring everything up to a boil, reduce the heat and simmer until everything thickens up and melds together. About 15- 20 minutes. Before serving, I pick out any large tomatoes and chop them then re-add. Get rid of the bay leaves. Zees?!? You call zees cassoulet?!? Zees is stew! Zees is AN OUTRAGE! An OUTRAGE! Now where are my ceegarettes?!? Back in your Bastillian cage, you! I am a 40 something all American guy interested in the historical, the luscious and the beautiful. Hopefully, this will be a good venue to occasionally share stories of food, cooking, thrifting, design, or whatever else is currently tripping my trigger. I love to travel and explore new places and clearly have a pathological desire to let everyone in on the details. Why Is Everyone So Uptight About Labels?